Several Office 365 updates this month can help companies of all sizes accelerate the digital transformation within their organization. We released Outlook Customer Manager, introduced Microsoft To-Do in Preview, extended Designer to PowerPoint on iPad, added support for Office 365 Groups in additional Office apps and more. Read on for the details. Outlook Customer Manager makes it easy for small businesses to track and grow customer relationships without leaving Outlook. Today’s rollout includes several new capabilities based on feedback we received during the First Release of Outlook Customer Manager. It’s easier to manage customers and upcoming deals with automatic reminders about customer inquiries, suggested company information from Bing and integration with Microsoft Flow. You can also access Outlook Customer Manager on the go in Outlook for iOS and Outlook on the web. Read more about Outlook Customer Manager. Availability: Outlook Customer Manager is rolling out to Office 365 Business Premium subscribers worldwide. It can be accessed in Outlook on Windows desktops, iOS and the web. Last week, we introduced Microsoft To-Do in Preview, an intelligent task management app that makes it easy to plan and manage your day. To-Do helps you stay organized and prioritize your most important to-dos for each day with intelligent Suggestions. Outlook Tasks also sync so you can stay on top of all your to-dos in a single view, wherever you go, across your devices. Learn more about Microsoft To-Do. Availability: Microsoft To-Do is now available in Preview for all customers and can be accessed on Windows 10 devices, iPhone, Android and the web. Designer in PowerPoint helps you create high-quality slides in seconds. Now when you’re on the go with your iPad, you can get professional design options for slides with images and certain types of text. Get started with Designer in PowerPoint. Designer now provides design recommendations in PowerPoint on iPad. Availability: Designer is now available in PowerPoint on iPad, for Office 365 subscribers. 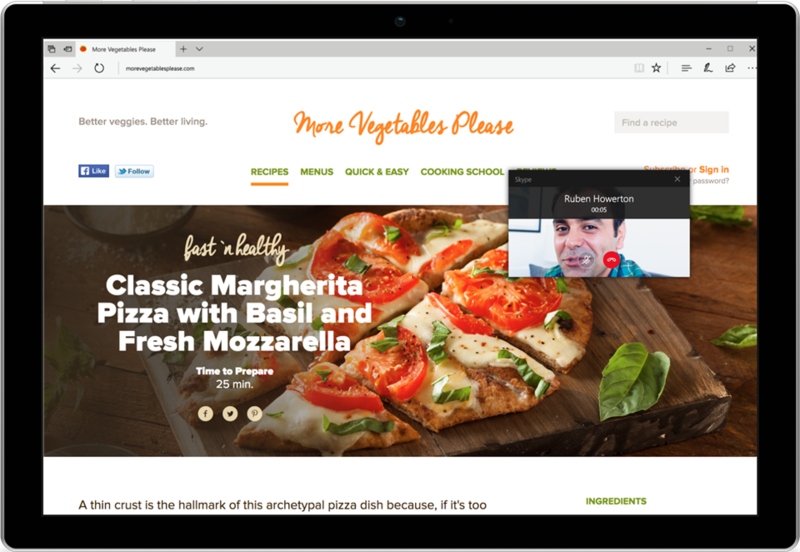 Designer was already available in PowerPoint on Windows desktops, Macs, Windows tablets, Android tablets and the web, for Office 365 subscribers. We’ve extended support for Office 365 Groups to more Office apps, making it easier for you to access shared team material and work better together. Groups in Word, Excel and PowerPoint—Now, you can open and save documents in your frequently used groups, without leaving the app you’re working in. 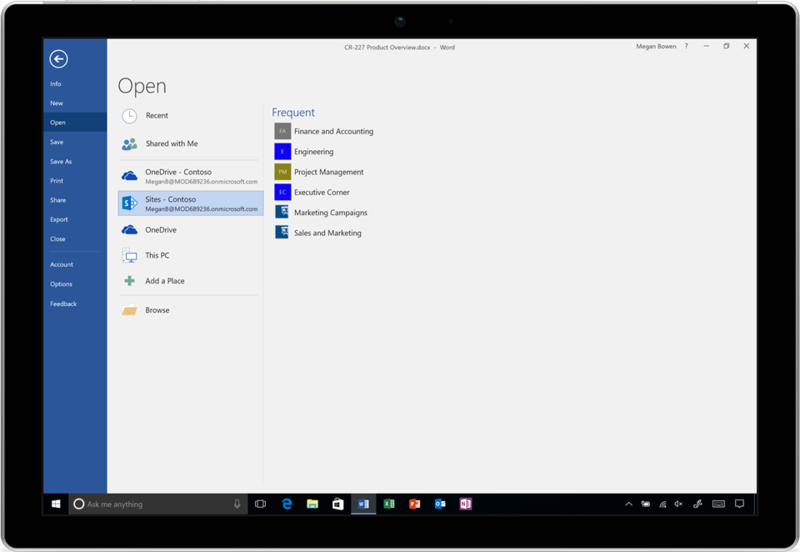 Access your frequently used groups directly within Office apps. Availability: Groups integration in Word, Excel and PowerPoint on Windows desktops is coming with this month’s Office 365 updates, for Office 365 commercial customers. Groups in Outlook for Mac, iOS and Android—Now you can view your groups list, read and respond to group conversations, add group events to your calendar and more in Outlook on every platform. Read more about groups in Outlook. You can now access groups in Outlook within Outlook for Mac, iOS and Android. Availability: Groups integration in Outlook is rolling out in Outlook for Mac, iOS and Android, for Office 365 commercial customers. Groups integration is currently available in Outlook on Windows desktops and the web. With the launch of the Windows 10 Creators Update, Skype for Windows 10 has graduated from preview and is ready for everyday use. Skype for Windows 10 now includes exclusive features such as mini view, SMS relay for Windows Phone and Skype Translator for calls to mobile phones and landlines. It is easy to use Skype with keyboard shortcuts, conversation search and a redesigned group video calling view that brings everyone even closer together. Read more about Skype for Windows 10. Skype for Windows 10 is generally available with new exclusive features such as mini view and more. Availability: Skype for Windows 10 is available for all customers as part of the Windows 10 Creators Update. Earlier this month, we announced several Office 365 security and compliance updates that help enterprise subscribers better protect, detect and respond to threats within their organization. Office 365 Threat Intelligence, now generally available, leverages the Microsoft Intelligent Security Graph to help you stay ahead of the evolving threat landscape. Office 365 Advanced Threat Protection (ATP) Safe Links is now available in Word, Excel and PowerPoint to protect users from clicking malicious links. ATP also includes new reports to help you understand your organization’s health. Advanced Data Governance, also now generally available, applies intelligence to help you retain high value data while reducing your risk profile. Lastly, a new Data Loss Protection (DLP) policy management page helps you configure and enforce sensitive data policies across your organization. Read more about these security and compliance updates. Availability: Office 365 Threat Intelligence, Advanced Threat Protection (ATP) improvements and Advanced Data Governance are all available and included for Office 365 Enterprise E5 and Secure Productive Enterprise E5 customers. ATP Safe Links is now available in Word, Excel and PowerPoint on Windows desktops, for Office 365 Enterprise E5 customers (or Office 365 ProPlus customers with ATP). Learn more about what’s new for Office 365 subscribers this month at: Office on Windows desktops | Office for Mac | Office Mobile for Windows | Office for iPhone and iPad | Office on Android. If you’re an Office 365 Home or Personal customer, be sure to sign up for Office Insider to be the first to use the latest and greatest in Office productivity. Commercial customers on both Current Channel and Deferred Channel can also get early access to a fully supported build through First Release. This site explains more about when you can expect to receive the features announced today.